Legislation intended to create an Intermediate Court of Appeals narrowly passed the Senate with a 17-16 vote, Monday. If passed into law, Senate Bill 266, would ultimately establish an additional layer to the state’s existing court through an Intermediate Court of Appeals. Following the bill’s introduction on Jan. 11, Senate Bill 266 was placed on the Senate Judiciary agenda for Jan. 25. In a presentation offered by counsel, members first learned specific details of the potential court which would be statutorily created and operable on July 1, 2020. Counsel stated following revisions of the introduced legislation, the court would be operated by three appointed judges, all of which would be nominated by the governor and passed through advice and consent of the Senate. Serving as a new court system, the Supreme Court of Appeals would be designated to serve as the administration over the intermediate court and have the constitutional authority to promulgate all rules of practice and procedures. Senate Bill 266 further explains the court’s appellate’s jurisdictions would lie within giving final orders or decisions to: circuit courts in civil cases, circuit courts in guardianship and conservatorship cases, family courts, administrative agencies and the Worker’s Compensation Board of Review. In order to have a case come before the intermediate court, the bill explains that a filing would have to be completed through the Supreme Court clerk’s office, and a $200 filing fee would have to be paid; filing fee proceeds would then be deposited in the West Virginia State Police Forensic Laboratory. Currently, the bill lists the court’s jurisdictional limitations relating to: criminal proceedings, juvenile proceedings, child abuse and neglect proceedings, mental hygiene proceedings, cases involving challenges to election practices, appeals from the Public Service Commission, extraordinary writs, interlocutory appeals and certified questions. The senator further explained that although the legislation seeks to broaden the scope of jurisprudence, he believes the state’s Supreme Court has actually been hearing fewer cases than years prior and raised concern as to why the Legislature is still seeking to expand the state’s court system. Sen. Trump argued that if passed, Senate Bill 266 also would give the court a broader base of jurisprudence and flexibility to address the state’s appeals, no matter the decision. “There are many legal questions in West Virginia that our Supreme Court can’t answer or develop now because they have themselves strapped to a rule change they made in 2010,” Trump said. This change in rule, which arose out of a decision from the state’s Supreme Court in 2010, states that the Supreme Court could promulgate the Revised Rules of Appellate Procedure to govern that all appeals from orders entered on or after December 1, 2010 would have to come before the state’s Supreme Court. The ultimate goal of the legislation would be to add an additional layer to the current court system and change the flow of which appeals move through the state’s courts. Currently, cases decided by the state’s smaller courts must receive mandatory review from one of three upper courts in the state prior to coming before the Supreme Court; cases decided by administrative agencies receive decisions from the Kanawha County Circuit Court; the Office of the Judges cases currently receive their decision from the state’s Workers Compensation Board of Review. By providing an additional layer to the state’s existing court system, the intermediate court would stand as a mandatory buffer between the upper courts and the state’s Supreme Court. The main responsibility being to issue written decisions - a decision which constitutes binding precedent for lower courts. The intermediate court would also aim to assist the Supreme Court in hearing more cases, leading to more time for the Supreme Court to focus on signed decisions. Last year saw a drop in signed decisions offered by the Supreme Court with 48 fewer decisions than the previous year. These decisions, which are regarded as having high precedent are delivered by a justice and create new point(s) of law. Despite the intermediate court’s ability to aid in signed decision, Romano said the fiscal impact of the proposed legislation wouldn't be worth the establishment of a new court system. While on third reading, the senator from Harrison further explained that although the total cost of West Virginia’s proposed intermediate court has gone down as a result of a reduction in judges, he believes the total cost currently doesn’t account for other staff members who will be employed by the courts. The bill lists the annual salary for the three judges which is to be established at $130,000 per year in addition to retirement benefits; salaries and costs were included in the appropriation for the Supreme Court of Appeals according to council. Judges who are appointed to the court will be expected to serve 10-year terms with an exemption concerning initial appointment, a process which would establish staggered terms. The legislation explains if a judge were to leave the court, their early vacancies would only be filled for the unexpired term. If passed, the bill would require the chief judge of the intermediate court to submit a bi-annual case report which lists the following: any motion pending before the court for more than six months and any case pending before the court for more than three months. Before being sent to the House of Delegates, Senate Bill 266 contained two overall fiscal notes, one from the Consolidated Public Retirement Board concerning retirement, and one from the state’s Supreme Court of Appeals. In their note, the Supreme Court indicated the total cost for the initial year would be set at $7,630,350 and $6,344,750 thereafter. Of the total initial cost, $4,839,750 is set aside for personal services. Following review of the bill by Judiciary committee, the legislation was sent to the Senate Finance Committee where a committee substitute was created and reported to the full Senate. Under the introduced versions the bill, cases offered by family courts would have to receive decisions from circuit courts before coming under review of the intermediate court and potentially arriving at the state’s Supreme Court, but following the creation of a committee substitute for the committee substitute from the finance committee, the process was amended to allow family court cases to bypass the intermediate court. Finance Committee chairman, Sen. Craig Blair, R-Berkeley explained that the change in legislation spurred from a need to further strengthen the court by making it more proficient. Blair further explained that if passed, he believes the amended bill would aid in attracting corporations to the state due the Intermediate’s swift review process. Despite disagreeing with the change in legislation, Trump said his main concern was having the bill be well received by the House. Completing review from committees, the bill arrived on third reading Feb. 18, where review of the legislation sparked debate among many senators. Despite the absence of Sen. Sue Cline, R-Wyoming, the legislation was passed by a 17-16 vote from members of the Senate. As of Feb. 19, the bill has beenrecieved by the House where it currently awaits placement on the House Judiciary Committee’s agenda. Anticipating the arrival of the bill, Delegate Kayla Kessinger, R-Fayette, a member of the House Judiciary Committee, said she’s happy to see the bill’s departure from its house of origin. 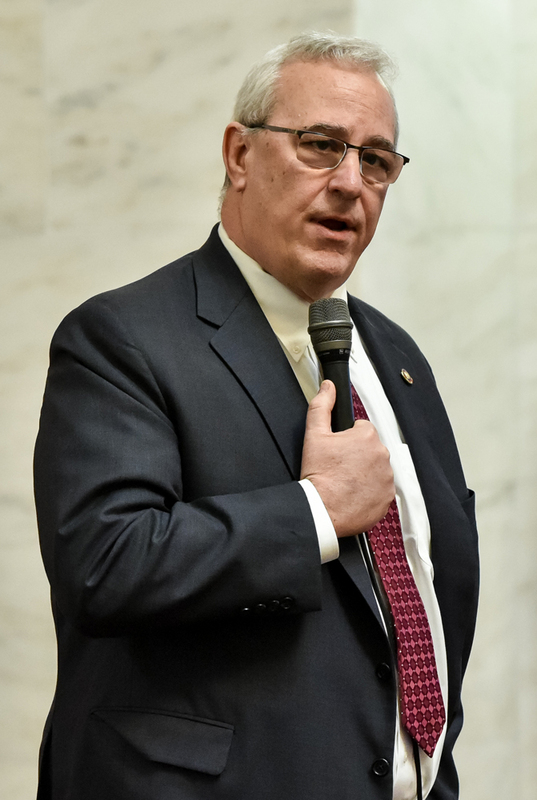 “An Intermediate Court of Appeals would guarantee West Virginia business and families a judicial system that serves their best interests and not those of special interest,” Kessinger said. As of 4:00 p.m. Friday, February 22, 2019, the 45th day of the first regular session of the 84th Legislature, 670 bills have been introduced to the senate. Of those bills, 141 have passed and have been sent on to the House for further consideration. SB 29: This bill intends to create a tax credit for businesses locates on post coal mining sites. The businesses would be eligible for the tax credits for the first five years after locating to the site. This bill also gives the state tax department rule making ability to create forms and regulations in regard to this tax credit. SB 117: This bill creates a number of incentives for consolidation at the municipal, county, and metro-government level. Terms are redefined throughout code to allow for certain benefits to be made available to consolidated local government. In particular, consolidated municipalities may take advantage of additional powers currently reserved for Class I or II municipalities or counties. These are spelled out in code and include the authority to create development and redevelopment districts, exercise eminent domain, receive grants from the federal government, make decisions about public sidewalks, construct capital improvements, enter into intergovernmental agreements, and others. SB 147: The purpose of this bill is to shift funds from the Solid Waste Landfill Closure Assistance Program to county solid waste assessment fees. Current law provides that county or regional solid waste authorities impose a $.50 fee per ton upon the disposal of solid waste in the county. Additionally, a DEP solid waste assessment fee of $3.50 per ton is assessed for disposal at a solid waste disposal facility. This bill would raise the county solid waste assessment from to $1.50 and lower the DEP to $2.50. SB 259: The bill would better control coyotes, which are interbreeding with wolves and becoming larger and veracious. The bill seeks to better protect state livestock in the state. Final orders and decisions in guardianship and conservatorship cases. SB 295: The bill would include court security officers, the state fire marshal assistant, and deputy fire marshals in the definition of persons against whom obstructing an officer is a crime. SB 310: The bill would prohibit a health insurance contractor that covers dental services or a participating provider that has an agreement with a dentist from setting fees unless the services are covered services. SB 333: The purpose of this bill would be to exempt from taxation any private passenger automobile that is greater than 25 years or older. SB 340: The bill repeals article 20F of the insurance code, which created the Physicians’ Mutual Insurance Company Act. The purpose of the aricle, originally enacted in 2001 and subsequently amended, was to create a mechanism for the formation of a physicians’ mutual insurance company that would provide a means for physicians to obtain medical liability insurance that is affordable, while also compensating persons who suffer injuries as a result of medical professional liability. The Board of Risk and Insurance Management (BRIM) was tasked with implementing the initial formation and organization of the company. The article creates a special revenue account, specifies that the company is to have a board of directors of certain members, and provides for the transfer of policies from BRIM to the company. SB 344: This bill amends statutes relating to the operation and management of state-owned farms by the Department of Agriculture. SB 360: The bill would regulate third-party litigation financing. A litigation financing transaction is a non-recourse transaction in which financing by a third-party, who is unrelated to the case, is provided to a consumer in return for a consumer assigning to the litigation financier a contingent right to receive an amount of the potential proceeds of the consumer’s judgment, award, settlement, or verdict obtained with respect to the consumer’s legal claim. All litigation financiers to register with the secretary of state. Provide the consumer with a completed, written agreement. Contract must contain a right of rescission within five days of receiving funds. Paying, offering to pay, or accepting any commissions or referral fees to or from any attorney, law firm, medical provider, chiropractor, or physical therapist. May not use false or misleading advertisements. SB 402: The intention of this bill would be to designate the Division of Forestry as the primary investigative agency as to theft and destruction of timber throughout the state -- not just state forests. It would also rewrite the penalty provisions for timber theft, intentional destruction, etc. SB 489: The bill would provide for licensure of pharmacy benefit managers with the Insurance Commissioner, sets forth minimum reimbursement rates, and requires PBMs report data to PEIA. SB 502: The bill would exempt sales of investment metal bullion and investment coins from state sales tax. Currently, the West Virginia Department of Tax collects a 6% sales tax on all sales of gold and precious metals, similar to the tax treatment provided other tangible personal property. The requirement that a 30-day notice for filing a claim to include specified information about any agents, servants, employees or officers of the health care provider who is to be named in the potential suit. The requirement that a person who signs a letter of merit list all medical records or other information he or she reviewed in rendering their decision regarding the merit of the potential suit – this is also true of actions where a certificate of merit is not required due to a well-established legal theory of liability and where the action is against a nursing home or like facility. Requires that the person who signs the certificate of merit have the qualifications of an expert witness as set forth in our code. SB 512: The bill would add regulation to pawnbrokers. Effective Jan. 1, 2021, the bill would require a pawnbroker to equip each of its locations with electronic monitoring and recording equipment. Video must be kept for 30 days. It also lists people from whom the pawnbroker may not purchase, accept in pawn, receive in trade or exchange for goods, such as minors or persons under the influence of alcohol or drugs. SB 519: The bill would add training requirements of people working as a dispatcher in a county emergency dispatch center. It also adds the requirement that they have training in emergency cardiovascular care for telephonic cardiopulmonary resuscitation. SB 545: The proposed bill would eliminate outdated HIV testing protocols by insurance agencies. SB 550: The bill would direct payment of certain claims made by those who have provided commodities and services to state agencies who have not been paid because, if the claims were paid, the agencies would have unlawfully spent more than their authorized appropriations or for services not lawfully contracted. SB 553: The bill would ensure the state provides the full matching funds required for its two land grant institutions to claim their full federal funding. SB 587: The bill would set the amount the West Virginia Public Employees Insurance Agency will reimburse air-ambulance providers for the transportation of individuals covered by its plans. SB 601: The proposed legislation would authorize the Division of Corrections to release inmates 180 days prior to his or her discharge date if they have not been released on parole. The inmate may be placed on electronic monitoring during the period of supervision. SB 613: The bill would require the Commissioner of the Division of Natural Resources (DNR) to include an option for organ donation on hunting and fishing licenses, and would also require publication of the ability to have the option to add organ donation on these licenses. The bill passed the Senate unanimously, and will be reported to the House of Delegates. SB 617: The purpose of this bill is to allow a municipality to prepay its required contributions to the municipal police and municipal fire pensions funds. Currently, the code provides that one-twelfth of the municipality’s annual contribution must be paid on at least a monthly basis. This bill simply provides that a municipality is authorized to prepay such contributions. SB 635: This bill would establish multiple changes to rule and code concerning three essential parts: Economic Development, Environmental, and Underground Coal Mining. SB 636: The bill would to authorize legislative rules of the Higher Education Policy Commission and the Council for Community and Technical College Education. HB 2324 : The bill authorizes the West Virginia Acupuncture Board to issue certificates to perform auricular acudetox therapy. The bill also provides for inactive and retired persons to be issued certificates provided the last three years of active status were performed in good standing. It would also provide for the board to issue certificates to persons who hold a certificate or its equivalent from another jurisdiction during a public health emergency or state of emergency. HB 2481: The bill would permit the retail selling of liquor on Sundays from 1 p.m. to midnight. HB 2607: The bill would update references to the secretary and bureau within the agency responsible for regulating nursing homes. HB 2666: The bill would appropriate $6,200,000 in general revenue for the fiscal year ending June 30, 2019 to the Department of Veteran’s Assistance. $6 million of these funds will go to the state’s Veteran’s Nursing Facility. HB 2668: The bill would appropriate $15.3 million dollars from the general revenue to Department of Administration – Public Defender Services. As of 3:00 p.m. on Friday, February 22nd, the House of Delegates has introduced 1,134 bills. Of those bills, 143 have been passed. House Bill 2768 was passed unanimously. This bill would make technical changes to the 2018 Opioid Reduction Act passed by the WV Legislature last year, as well as address inconsistencies with how therapy services in the state administer Schedule II opioid drugs. The bill would also ensure compliance with federal code. House Bill 2834 was also passed in the House on this day. This bill would modernize the minimum spacing provisions for the drilling of state horizontal deep wells. The bill would impose limitations for what the Oil and Gas Conservation Commission can do as far as regulation of these horizontal oil and gas wells. House Bill 2849 would define the scope in which a nuclear pharmacy technician can operate. It defines the nuclear pharmacy technician’s certificate and specifies the duties each category of pharmacy technician is permitted to perform under supervision of a licensed pharmacist. This bill was also passed and advanced. House Bill 2486 would remove barriers to employment for individuals with criminal records who seek licensure or certification in an occupation. 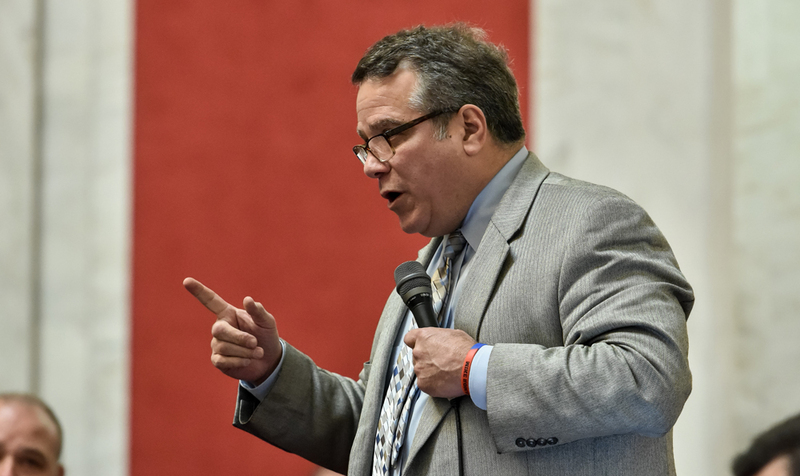 This bill could be used to help West Virginians seek employment, providing that their criminal conviction is not directly relevant to the job that they are seeking licensure for, and that the criminal conviction is not sexual or violent in nature. House Bill 2975 was also passed on this day. This bill would update current statute to include employees and contract employees of a day report center to those prohibited from engaging in sexual acts with prisoners, those persons under their supervision. Currently, correctional officers and guards are prohibited from engaging in sexual acts with prisoners or subordinates. This bill would just add day report center employees to that list. House Bill 2730 would issue a pay raise to the state police, WV K-12 school teachers, and WV school personnel starting this fiscal year. The raise would be five percent more than the aggregate salary of these state employees. Senate Bill 444 would increase supplemental appropriations to the Department of Health and Human (DHHR) Resources Laboratory Services Fund by $885,554. It would also increase the supplemental appropriations to the DHHR’s West Virginia Birth-to-Three Fund by $885,554. Senate Bill 443 would apply to federal block grants in terms of how the state of West Virginia uses them for DHHR’s provided mental health services, childcare, and other miscellaneous items. Senate Bill 442 was another supplemental appropriations bill that involves the WV Department of Revenue. This bill would allow the Insurance Commissioner to utilize federal block grant money. Senate Bill 13 would restore $11 million to the purse funds for racetrack horses in the racing industry. This bill would restore money that was taken from the purse funds by the state in 2005 to help fund needed worker’s compensation cases. House Bill 2532 would grant West Virginians renewing their drivers’ licenses or vehicle registrations the ability to make a contribution in the amount of $3, $5 or $10 to the West Virginia Farm Bureau, the West Virginia 4 H Program, or the West Virginia Future Farmers of America Education Foundation. House Bill 2540 would make it unlawful for any person through carelessness, neglect or otherwise to let any edible portion of any big game or game fish to go to waste needlessly. The bill also provides for penalties and gives the Division of Natural Resources the authority to enforce this law. House Bill 2541 was also passed this day. This bill updates safety measures for public K-12 schools in West Virginia. House Bill 2541 would to require county boards to implement a safety plan for public schools, containing the following requirements: visible room numbers on the outside of the building, provide updated school floor plans to local first responders and law enforcement, and provide active shooter and first aid training to teachers and students. House Bill 2807 would provide a reducing modification to the West Virginia adjusted gross income of a shareholder of a Subchapter S corporation engaged in banking business in WV. House Bill 2829 would terminate the state severance tax on the extraction of limestone and sandstone starting in 2021. The bill comes with a fiscal note of $1.2 million, but because of the Division of Highways being the largest purchaser of limestone and sandstone in the state, a lot of that cost would be directly funneled back into the state. House Bill 2901 would allow a licensed racetrack to establish a secondary location for racetrack video lottery terminals and racetrack table games at a location within the county as approved by the lottery commission. House Bill 2934 would authorize licensing in the state for interactive wagering. Casinos in the state would be allowed to create applications to allow individuals to wager digitally on a mobile device or desktop. There would be a 15% privilege tax on these games. House Bill 2452 would establish a cyber security framework within certain state agencies. This bill would allow the West Virginia Office of Technology to establish a Cybersecurity Office within their department to facilitate a software program to strengthen the cyber security checks within state agency devices. This bill would be applied to all state agencies except for institutions of higher education, the county board of education, the WV Legislature, and the WV Judiciary. Agencies would be subject to cyber security risk assessment, adherence to enterprise standards, and plans of action in the event of a cyber-attack. House Bill 3132 would provide that medical providers serving no more than 30 patients would not need to comply with certain legislative rules and only attest to services being provided. House Bill 3132 would also mandate that licensed behavioral health centers providing office-based medication-assisted treatment are exempt from the separate registration process for other office-based medication-assisted treatment programs, and instead only have to attest to their services. House Bill 2079 would increase the maximum number of cannabis grower, processor and dispensary permits. The bill would also remove the requirements that licenses be limited in regions of the state. The bill would increase the maximum number of state cannabis growers and processors from 10 to 50. It would increase the increase the maximum number of cannabis dispensers to 165 in the state. House Bill 2433 would mandate that schools in the state of West Virginia would start no earlier than Labor Day and end no later than Memorial Day. Senate Bill 1 would increase access to state community and technical schools by providing financial aid and payment tuition for West Virginia individuals who qualify. The bill would require the WV Chamber of Commerce to research underserved fields in the state that need more employees in order to ensure that the state’s community and technical schools have applicable programs. The bill would also create the WV Grant Program and create the WV Invests Fund. House Bill 2397 would increase the ratio for licensed psychologists to students in a given WV classroom. The bill would increase the ratio of these licensed professionals by 2021 to be 1 psychologist to every 500 students. House Bill 2853 would require the Library Commission to establish the West Virginia Program for Open Education Resources to encourage and facilitate the use of open education resource materials in both higher education and public schools. House Bill 3127 would allow homeschooled and private school students to participate in public school extracurricular activities that are within their district. Senator Romano expresses his opposition to the legislation creating an Intermediate Court of Appeals.